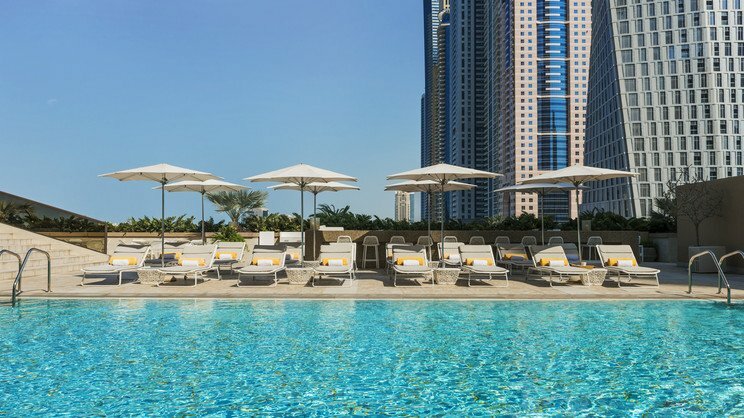 Standing tall above the city of superlatives and overlooking the chic Dubai Marina, the Grosvenor House Hotel is a glimmering, glamorous choice for a sumptuous stay . An Exceptional Starwod Luxury Collection Hotel, Grosvenor House features 45 storeys containing 749 guestrooms, suites and apartments, and a wealth of fantastic restaurants, business and leisure facilities. Elegant, sophisticated, chic and vibrant, this hotel is the epitome of luxury and an instantly recognisable icon of modern Dubai. Minutes from the beach and Media City, plus other famous attractions, Grosvenor House offers a combination of rooms and suites with a superb design and flawless facilities. Split into two towers with breath-taking panoramic views, the hotel offers a spa and gym in each tower, a selection of swimming pools and is even home to the world-renowned Buddha Bar where guests can delight over expertly-crafted cocktails and Pan-Asian specialties. Stunning and convenient location on the Dubai Marina, with a plethora of attractions available close by. A free, 3-times daily shuttle service to the Mall of the Emirates. Use of sister property, Le Royal Meridien facilities which includes beach access. The nearest beautiful beach is just a short walk from the hotel. There is also a shuttle service to the sister property Le Royal Meridien which offers beach access. The hotel is within immediate proximity of Dubai marina and also close to the Palm Jumeirah. Dubai International Airport is approximately 35km away from the Grosvenor House Hotel. Enjoy an ample 35 square metres of space finished with neutral decor promoting comfort and luxury. A beautiful 55 square metres allows for a seating area and spacious walk-in wardrobes in sophisticated style and decor. Located in Tower Two, these rooms feature up to 43 square metres of living space and extra amenities. A lounge area, work desk, touch screen panel and iPod dock, plus an upgraded 47" TV is provided. 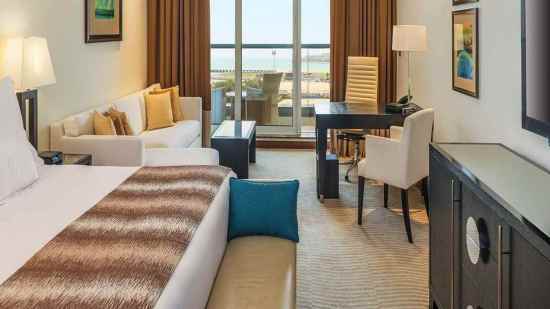 There is also a private balcony with views of the Arabian Sea, Palm Jumeirah and Dubai Marina. Other benefits to this room include access to the business lounge on level 5, and breakfast in the lounge. A generous 68 square metres of Deluxe Suite allows for a spacious lounge area separate from the bedroom. There is an additional guest washroom and some suites also feature a kitchenette. The room decor is warm and neutral, and a dining area to seat four along with complimentary breakfast at Sloanes are further benefits to this suite. 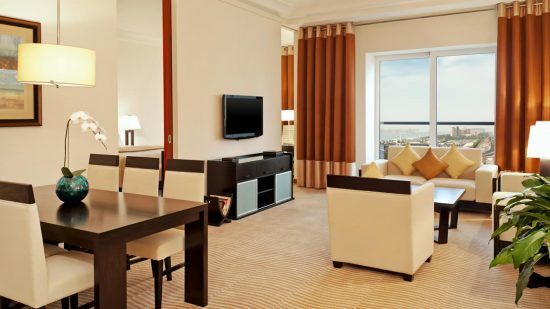 Stylish and elegant the 55 square metre Premier Junior Suites are located in Tower Two and are perfect in encapsulating the luxury of a Grosvenor House Dubai stay. Separate bedroom and lounge areas, feather weight duvets and pillows atop a signature king-bed, walk-in closets and marble bathrooms, plus access to the Executive Business Lounge, these are a few of the perks to a Junior Suite. Suitable for up to 3 guests, these suites offer 55 square metres of space furnished in warm hues with rich chocolate brown accents. 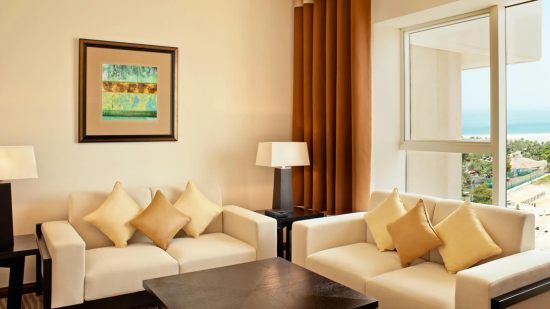 Located in Tower Two they offer a spacious lounge separated by sliding doors from the bedroom, large floor to ceiling windows and the option of connecting with a Premier Executive Suite for groups and families. Enjoy 24-hours personalised butler service as the privileges of a Premier Executive Suite make your stay comfortable and luxurious. With a Tower Two setting, a generous 82 square metres of accommodation allows for a spacious lounge and dining area separated from the bedroom by sliding doors. These suites also feature a pantry, additional guest washroom and a private balcony with fabulous views over Dubai. Options of connecting with a neighbouring Premier Suite also apply. A fabulous array of facilities sit in Grosvenor House Dubai, right in the heart of the city and close to all major attractions. The Grosvenor House hosts a ladies’ night every Monday at Toro Toro, where female guests can enjoy 3 complimentary drinks from 7pm to 12midnight. This fabulous restaurant and bar showcases the best in British cuisine. The charm and luxury of the venue is evident in the sophisticated decor and grand theme. Chic and classy yet casual and cheerful. Enjoy snacks on a fabulous terrace among the stylish cityscape. A fabulous Latin American restaurant, here is where the setting reflects the heat of the Buenos Aires and the vibrant flavours of Pan Latin along with the lively atmosphere of this part of the world. Enjoy all things Mediterranean at this contemporary and stylish venue. It's sophistication is evident both day and night bringing a different ambience from casual days to very classy nights. The fine dining experience continues with Indigo serving the very best of exquisite Indian cuisine under the guidance of Michelin-starred Chef Vineet Bhatia. A sumptuous buffet featuring innovative offerings. Hot and cold breakfasts followed by a range of lunch and dinner options such as pizzas, wok dishes, fresh fish, rotisserie and a carving station. Succulent and delicious Turkish cuisine in opulent surroundings.